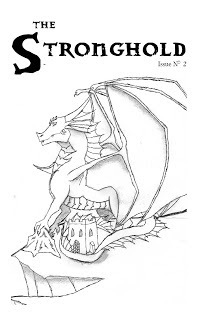 Published by Blue Moon Ink Press, The Stronghold though, is not a fanzine devoted to either of those retroclones, but rather to providing support for Dungeons & Dragons 3.x style campaigns along with edition-neutral material. Which means that it is still compatible with other retroclones with just a little effort upon the part of the Dungeon Master. Released in February, 2015, The Stronghold Issue No. 1 came with its regular features already set up and with tables aplenty. The second issue, The Stronghold Issue No. 2 followed in the June of 2015, adhering to the same design and features. The ‘Found Items’ feature for the second issue is the first of a two-part series. ‘Facing the Music: Musical Magic for Everyone – Part 1: The Bards of the Guild of Zaj’ provides an alternative source of musical magic for groups short on anyone playing the Bard Class—or indeed finds them useful. These can be performed on the five magical items owned by the most renowned bards of the Guild of Zaj, although they are not all strictly musical instruments. Thus, the Flask of Emrot only grants the ability to sing like a bard and ‘inspire greatness’, but only for a limited amount of time and only after the would-be bard has drunk the flask’s contents. The flask needs fuel though and this takes the form of potions of Cure Moderate Wounds. Most are musical items though, such as Titop’s Drums, timpani drums which can be played to cast Remove Fear or Irresistible Dance once per day, whilst The Good Man’s Reed is actually the remains of an ebony horn which when placed in the mouth, enables the user to cast Shatter, Sound Burst, and Whispering Wind. Besides the descriptions of the particular items, each comes with a short history of the original owner and the device itself. Given the musical and bardic focus of this quintet, it is not wonder that there is a slight quirkiness to them. Each nicely expands the range of magical items available and would probably be the envy of any Bard. ‘Malevolent Matter’ introduces the Gholl—which sounds like something undead and something like a cross between a Ghoul and Troll. Well, sort of… With a Critical rating of ten, four arms, paralysis, regeneration, and a penchant to grab and rend, this is a challenging foe. It has a trick up its rugose folds though—it feigns the effect of being turned or controlled! Which is a clever trick to pull on your cleric (at least once). The Gholl also stinks! ‘Malevolent Matter’ is also what the next column should have been called too. ‘Missives from the Hold’ is also appropriate, the column examining as it does the adverse effects of tavern provender. In particular, the digestive aftereffects and how they detract from the consumer’s subsequent attempts at stealth. Plus, the food is terrible into the bargain and there is an Experience Point award for actually consuming it. Nevertheless, this is just a bit silly and begs the question as whether any Dungeon Master would add it to his game. This is followed by ‘Treasure Tables’, four sets of treasure built for the same price in gold pieces. Full of mostly mundane items, they show how interesting hoards can be created on a budget. In effect, the second half of The Stronghold Issue No. 2 is one big article despite the fact that it consists of four separate parts. These are ‘NPCs Nasty and Nice’, ‘New Creature’, ‘From the Menagerie’, and ‘Local Locales’ and what they describe is an exotic pet shop in the city of Coldtreath, its all too calm owner, his six-legged cat, and some of the creatures he has for sale. The problem with this quartet is that it feels out of order, so that the description of the shop should come first, then its stock, and lastly its owner and his pet. Anyway, ‘NPCs Nasty and Nice’ details Theral “Papa” Quimby, an ex-soldier becalmed and kept distrustful of anyone with two legs by his pet, the ‘New Creature’, a Hugrarian Cat. This six-legged feline exudes serenity and is literally charming to the touch. It would probably make for a perfect familiar for the stay at home wizard. ‘From the Menagerie’ describes, but does not provide game stats for eighteen of the pets that Quimby has in stock—bar for one, the Ragehawk. A price list for other exotic creatures is also included and the description of ‘Local Locales: Papa Quimby’s Pet Emporium’ makes note of the wands he keeps for protection behind the counter. That suggests a high magic or high fantasy for Coldtreath and the pet shop at the very least. Overall, this is a decent package even if the write-up of the Theral “Papa” Quimby feels as if could be stronger and better written. Physically, The Stronghold Issue No. 2 is nicely put together. The artwork is decent, the writing in general good, and the layout has is nicely done such that it gives the fanzine a consistent feel and style of its very own. In the editorial of The Stronghold Issue No. 2, the author writes about having to deal with what is a difficult second issue. Now it would not be entirely fair to describe the issue as being difficult—it has issues, but not difficulties. The most obvious is the issue’s ‘Missives from the Hold’, a literal misfire memorable for its silliness rather than its usefulness. The lesser difficulty, the issue’s ‘NPCs Nasty and Nice’, is less of a problem as it is something that the Dungeon Master can adapt and use more readily. Not perfect, but nowhere near as bad as a difficult second issue might have been, The Stronghold Issue No. 2 picks up where The Stronghold Issue No. 1 left off by the good outweighing the not so good.